332 pages | 59 B/W Illus. Between 1955 and 1975 music theatre became a central preoccupation for European composers digesting the consequences of the revolutionary experiments in musical language that followed the end of the Second World War. 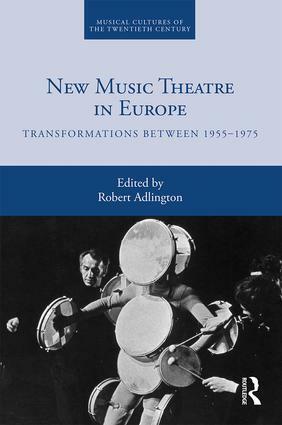 The ‘new music theatre’ wrought multiple, significant transformations, serving as a crucible for the experimental rethinking of theatrical traditions, artistic genres, the conventions of performance, and the composer’s relation to society. This volume brings together leading specialists from across Europe to offer a new appraisal of the genre. It is structured according to six themes that investigate: the relation of new music theatre to earlier and contemporaneous theories of drama; the use of new technologies; the relation of new music theatre to progressive politics; the role of new venues and environments; the advancement of new conceptions of the performer; and the challenges that new music theatre lays down for music analysis. Contributing authors address canonical works by composers such as Berio, Birtwistle, Henze, Kagel, Ligeti, Nono, and Zimmermann, but also expand the field to figures and artistic developments not regularly represented in existing music histories. Particular attention is given to new music theatre as a site of intense exchange – between practitioners of different art forms, across national borders, and with diverse mediating institutions. Robert Adlington holds the Queen’s Anniversary Prize Chair in Contemporary Music at the University of Huddersfield. He is author of books on Harrison Birtwistle, Louis Andriessen, and avant-garde music in 1960s Amsterdam, and editor of volumes on avant-garde music in the 1960s, and music and communism outside the communist bloc. He has written articles and chapters on Nono, Berio, musical modernism, new music theatre, and musical temporality.